Although simple, this was one of my youngest weaner’s favorite meals when she was about 10 months old! Once you have introduced sweet potatoes it is okay to mix it with chicken after 8 months. Feeding chicken alone is too bland for some weaners (not all) and if they have a familiar taste to go with it they are more willing to eat those first meats! Preheat oven to 400 degrees. Poke each sweet potato seven times and wrap in tinfoil. Cook sweet potatoes for 40 minutes. Place chicken on baking sheet and place in the oven. Cook sweet potatoes and chicken for another 20 minutes. Dice into small pieces or puree in a food processor or blender adding breast milk or water as needed. Pour/spoon into Wean Cubes. Remember to check the temperature before serving. Store the leftovers in the fridge for 3 days or the freezer for 3 months. 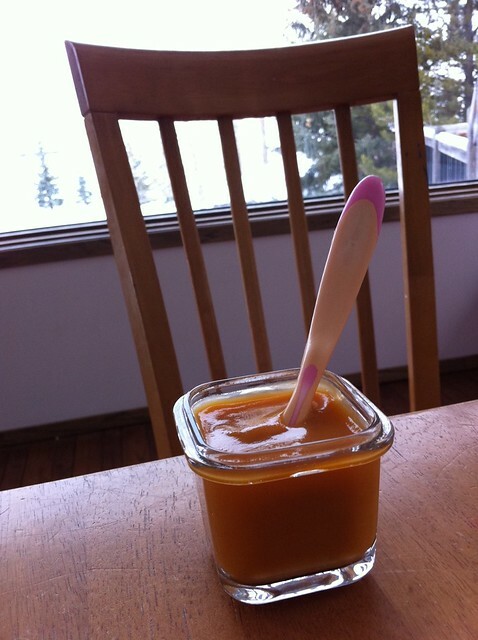 This entry was written by Melissa, posted on January 5, 2011 at 7:07 pm, filed under Recipes of the Week and tagged homemade baby food, recipe. Bookmark the permalink. Follow any comments here with the RSS feed for this post. Post a comment or leave a trackback: Trackback URL.